This week the VORTX will pump out double shots from Three Days Grace! Three Days Grace is a well-known rock band from Canada. These guys are typically welcomed, unlike their Canadian brothers in Nickelback. They put out a new record called Outsiders earlier this year. The band holds the record for most #1 songs on the mainstream rock charts with “Infra-red” being the latest song to go #1. We’ve got a new single for you this week off of the Outsiders record called “Right Left Wrong” and we think that you are going to like it. 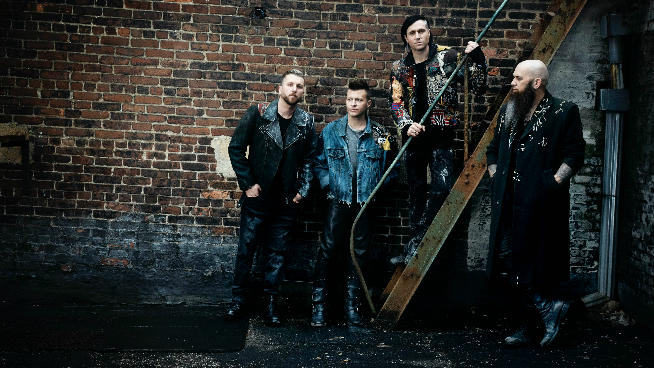 I had a chance to chat with Three Days Grace drummer Neil Sanderson over the summer when the new record was released. Check out my interview with him below! Along with new music from Three Days Grace, this week you’ll hear the latest track from Slipknot called “All Out Life” as well as music from Fight The Fury, Underoath, and Jonathan Davis. Don’t forget to keep up with us on Facebook and Twitter for all of the latest updates from inside the Vortx. The VORTX understands that all of these songs may require headbanging, moshing and overall stupidity. In the case that any of these required actions take place the Vortx is not responsible for any injuries and will not pay for trips to the chiropractor. Any and all actions that may cause harm are not encouraged by the Vortx, but if you do choose to participate we sure as hell won’t stop you. If you are unable to make it to work Monday morning due to neck pain please have your immediate supervisor email vortx@v100rocks.com and we will tell them everything. We’ll see you soon. Check out our top videos of the week below!